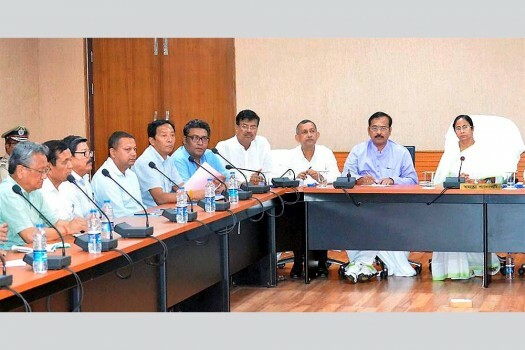 West Bengal Chief Minister Mamata Banerjee meeting with the members of GJM, JAP, GNLF and other Gorkha leaders at Uttarkanya near Siliguri. 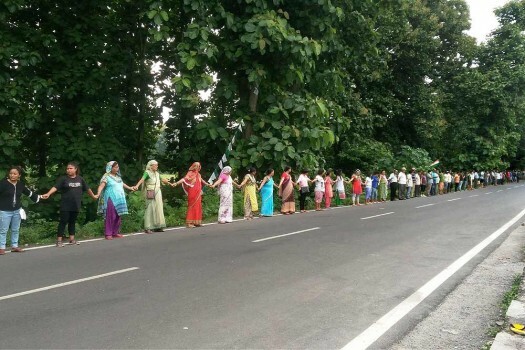 Gorkha Janmukti Morcha (GJM) activists form human chain during a protest in Sukna near Siliguri. 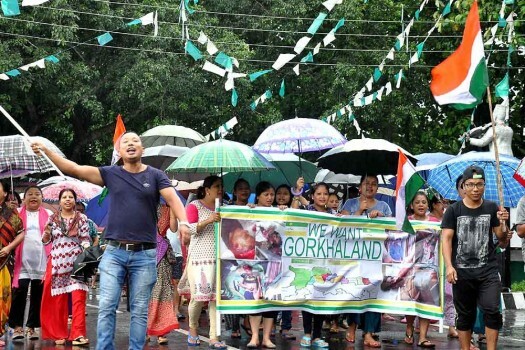 GJM supporters take out a mass rally to demand for separate state 'Gorkhaland' during a protest in Sevok near Siliguri. Gorkhaland Movement Co-ordination committee(GLMCC) Convenor Kalyan Dewan (C) interacts with media after a meeting with West Bengal Governor Keshari Nath Tripath, in Kolkata. 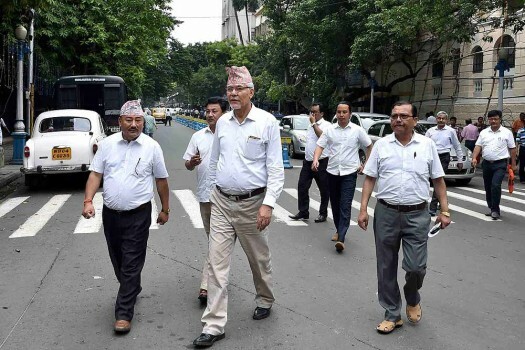 Gorkhaland Movement Co-ordination Committee members arrive at Governor's House for a meeting with West Bengal Governor Keshari Nath Tripath in Kolkata. 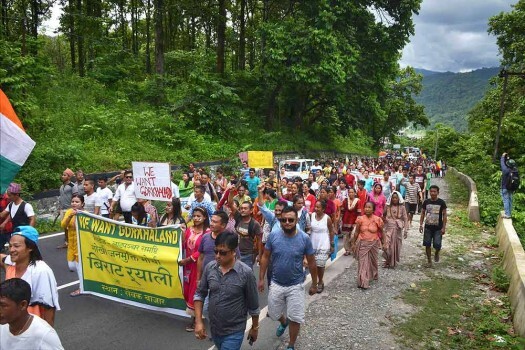 GJM supporters take out a mass rally to demand for separate state 'Gorkhaland' during a protest in Sukna near Siliguri. 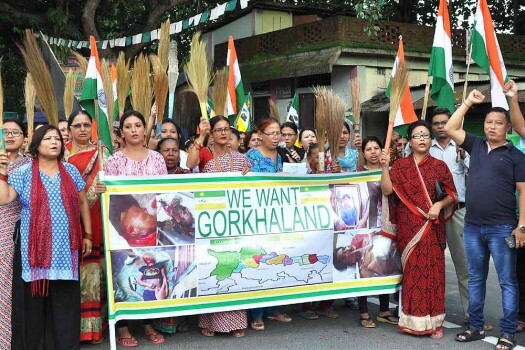 GJM supporters raise slogans and hold brooms as they take out a protest rally in Sukna, Siliguri. 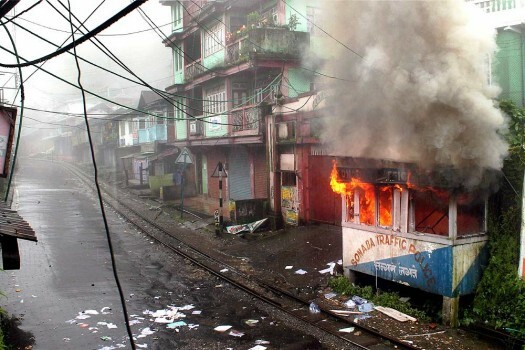 A traffic police post in fire after it was torched by the GJM supporters during their violent protest. 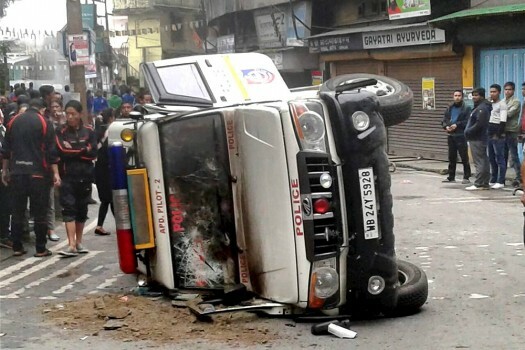 A police vehicle damaged during violence following the death a youth allegedly in police firing, in Darjeeling, West Bengal. 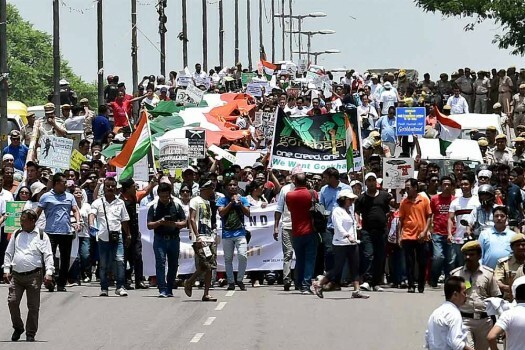 Members of People's Movement for Gorkhaland carry a 110 mt-long Tri-Colour during a peace march from Rajghat to Jantar Mantar in demand for separate Gorkhanland, in New Delhi. 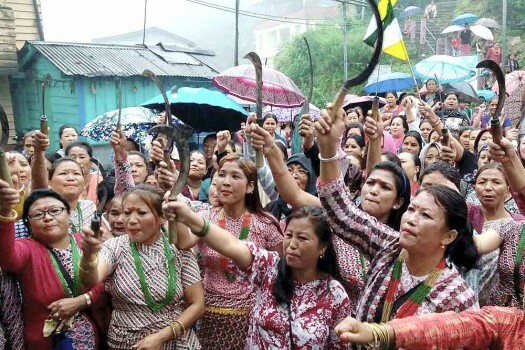 GJM woman suppoters take part in a mass rally in Mangpoo near Darjeeling. 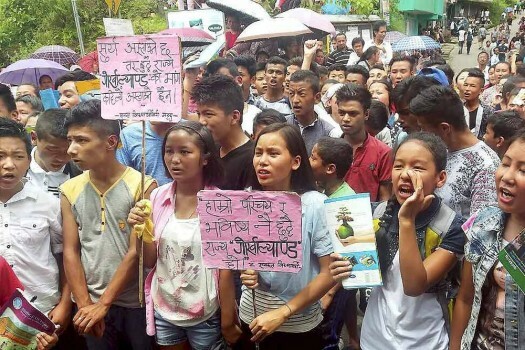 Student's wing of GJM protest for demand of Gorkhaland in Mungpoo near Darjeeling. 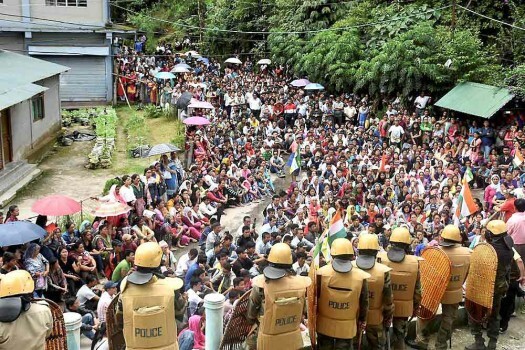 GJM supporters take out a mass rally to demand for separate state 'Gorkhaland' during a protest in Mirik near Darjeeling. 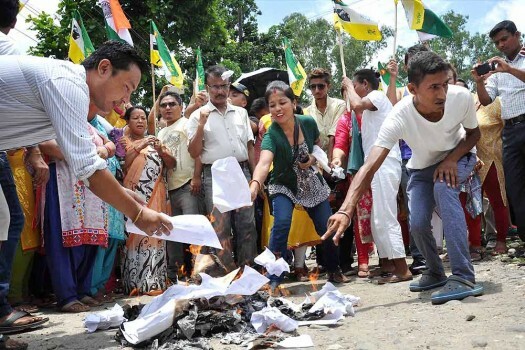 GJM supporters burn copies of Gorkhaland Territorial Administration (GTA) agreement during a protest at Dagapur village, in Siliguri. 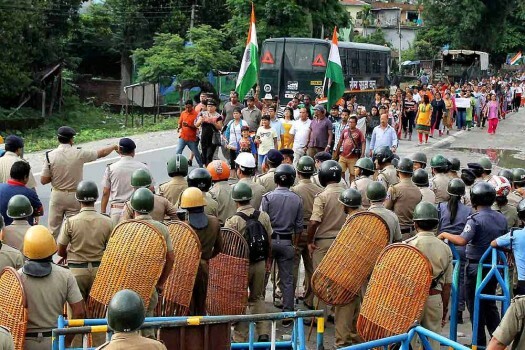 Security men guard as GJM supporters hold a rally demanding separate state of Gorkhaland in Siliguri. 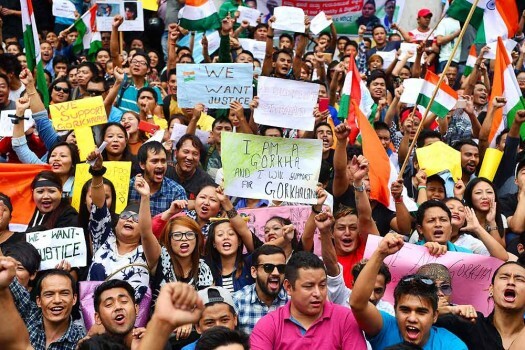 Members of Gorkha Community hold placards and shout slogans to demand for separate 'Gorkhaland', during a demonstration in Bengaluru. 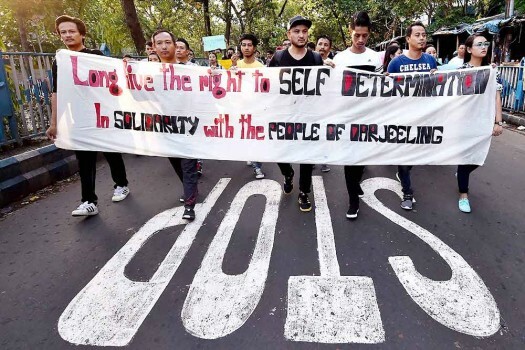 People of Darjeeling Hills and adjacent regions hold posters and participate in a silent rally in Kolkata to express solidarity with the people of Darjeeling. 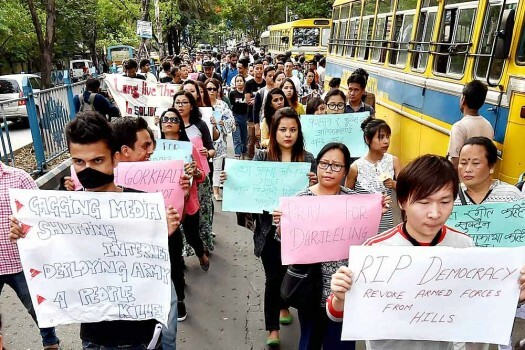 A section of the hill residents, however, feel short-changed by the BJP, which earlier showed sympathy towards the Gorkhaland agitation, but is coy about the demand in this poll, as it does not want to spoil its chance in the other 41 seats in Bengal. 'How is Raju Bista?' 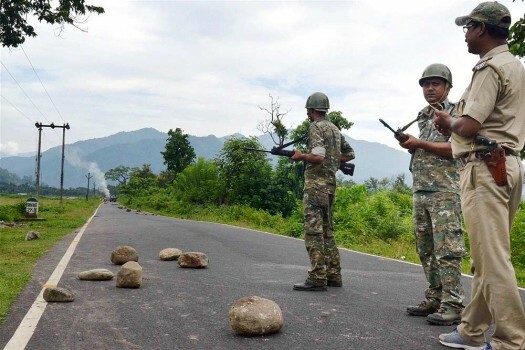 is a question making the rounds in the politically fractured and strategically placed hills in Northern Bengal. 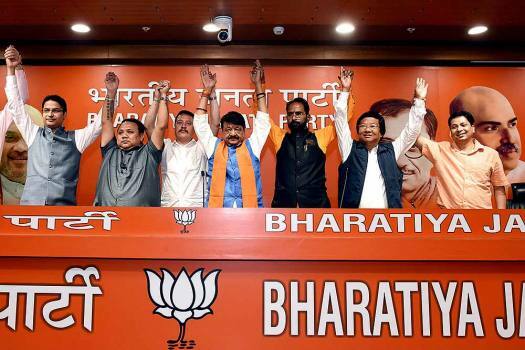 Raising the bogey of Gorkhaland periodically, hill parties have tried to stay relevant in the hill politics, say analysts. 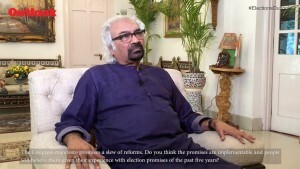 However, no political party or leader has been sincere in resolving the century-old demand. 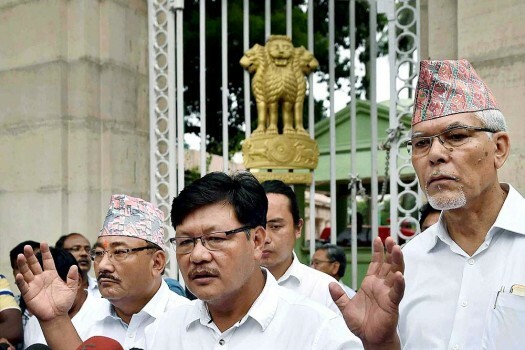 The GJM leader had claimed in the top court that he was being politically persecuted by the West Bengal government. However, five additional companies of the CRPF will be in the hills to assist the state police force. A sub-inspector was shot dead and four policemen were injured in clashes allegedly with Gurung's supporters on Friday. He said the police faced "heavy fire power" from the group which led to the death of a police sub-inspector and injuries to four police personnel. On Thursday, Ghosh was allegedly chased and heckled by rebel GJM supporters, who gathered and raised slogans for saying 'no' to Gorkhaland. Rajnath Singh, earlier in a statement, said that the Centre was taking all possible steps to resolve the row through dialogue.